The average rain fall in a year for the Valley is roughly 8″. But what is normal truly. Last year we had less than 4″ for the whole year. This week we have already had over 1 1/2 inches and more is coming, possibly 3″-5″ tonight. Be extra careful on the roads. We don’t normally get this amount of rain. There are lots of months with no rain, and nothing to wash the oil off the roads from cars. When the rain does come, our roads are more slick than you are accustomed to even if you come from a rain soaked area. 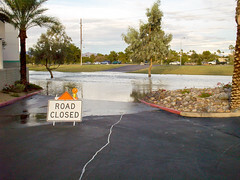 The roads dip down to allow the water flow across: A wash; is any dip in the road where water accumulates, it’s not just a puddle and could be deceivingly deep. The Stupid Motorist Law: (that’s really what it is called) has the driver pay for the cost of rescue services if needed to get you out of your car to safety. Driving in the rain, always be more alert. Driving in the rain in Arizona; be even more careful.